Instilling fear is a powerful tool in teaching right from wrong. In the U.S., many examples of this practice abound, such when someone is told, "You will be haunted for the rest of your life for that," or "Someday it will come back to haunt you." Imagine a charcoal- covered, flailing figure wearing a rustling raffia skirt. Its eyes pierce. A large mouth flaps wildly and clacks loudly. In the darkness you see it is headed directly toward you. 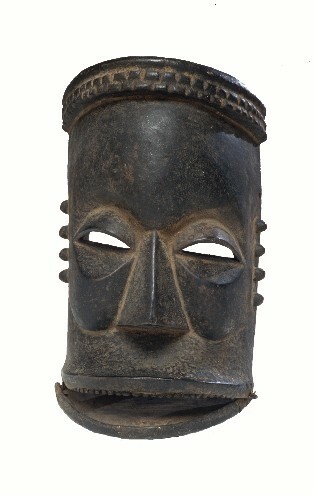 Such was the impact of this mask in the Ibibio culture. The figure, Idiok Ekpo, is designed to inspire both fear and respect. In Ibibio culture it is said that a doer of evil deeds will become a ghost like Idiok Ekpo. Idiok Ekpo's counterpart is a good and beautiful mask, Mfon Ekpo. Men in the ancestral spirit association called Ekpo play out the drama.